Is Your Horse Supplement Plan Really Working? One way to know if your horse supplement plan is working is to see how consistent you are in following it. Last month I found myself preparing to leave town and leave my horses in the care of a pet sitter. It was a royal pain getting all the individual bags of feed ready for each horse. It took me about 2 hours to get everything organized and I found myself questioning if my horse supplement plan was worth all the effort. Let's look at Remi, my 14 year old, Yang Ming(Metal/Earth) gelding. When I got Remi about 5 years ago his feet were horrible. He had severe contracted heels and terrible thrush in all four hooves. His hoof wall would grow down about half way and then flare out and crumble. He was tight through his whole body but especially in his ribs and shoulders. Remi would tie up for no obvious reason and he was nervous all the time. Over the years I found a program that has worked for him to grow out healthy hooves, relax his muscles and calm his nerves. When I looked at this program I could not see any product I would be willing to stop. Each supplement had a specific function and I was not willing to take the chance of losing all the progress Remi has made. 1# Kool and Kalm ultra low starch feed - I suspect Remi has a mild form of equine polysaccharide storage myopathy so I want a diet as low in carbohydrates as possible. Remi gets only the Kool and Kalm and Empower at night. He has plenty of coastal hay to eat and occasional grass if conditions are right for low sugar. Remi has done much better overall since starting the low starch, high fat diet. This does not surprise me since he is Yang Ming(Metal/Earth). Metal horses can handle more fat in the diet. The chia seeds have been great for Remi because they have a good fatty profile and plenty of minerals. I prefer not to feed processed foods but both the Kool and Kalm and Empower have been very consistent in quality and they make up a small portion of the overall diet. Cerise is my 20 year old TB/QH, Fire, mare. Cerise had been a pasture ornament when I got her and she was fat and shiny. She started having digestive issues when I started riding her and feeding her hay and formulated feed. Cerise got very tight in her ribs to the point of not wanting to have the girth tightened. It turns out she was sensitive to coastal hay and wheat. She also developed EPM but I was able to get her over it with good digestive support and an herbal product to fight the protozoa. Fire horses can be very emotional and can have digestive issues including ulcers. Ulcers can make any horse miserable so I would rather prevent them than treat them. Cerise gets mostly alfalfa hay with some coastal and native grass. She gets some magnesium from the algae and I will give her more if she seems nervous. 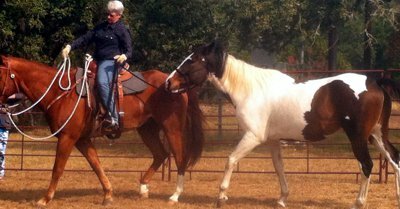 On this program she has no digestive problems and no issues with having the girth tightened. Tess is my 32 year old, Jue Yin(Wood/Fire) mule. Tess has been incredibly healthy all of her life but age is starting to catch up with her. She has some mild arthritis and will get stiff with cold or damp weather. Tess has been having more trouble in the last few years holding her weight even though her teeth are still in decent shape. So your horse supplement plan is working if you know the reason each product is being used and you see obvious results. If your supplement plan is not working drop products you don't understand or see benefits from and make changes. I have had great results using Five Element horse temperament typing to choose the most appropriate horse supplements. If your supplement plan is working don't change it! For more information on Five Element typing please check out our book, Horse Harmony, our Five Element typing eBook and our online certification course.